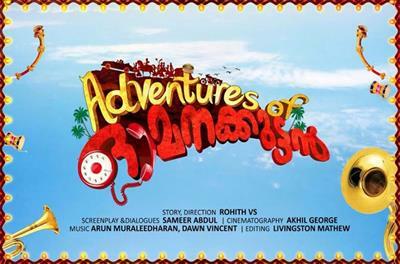 Adventures of Omanakuttan malayalam movie to be directed by Rohit V S featuring Asif Ali in lead will start rolling from January 2015. Scripted by Sameer Abdul, the movie tells the adventurous journey of a young guy named Omanakuttan. The tunes will be set by Arun Muraleedharan and Dawn Vincent. The cinematography of the movie would be handled by Akhil George. Rohit V S with an experience assisting major filmmakers is gearing up to make his independent project. The movie titled 'Adventures of Omanakuttan' will have Asif Ali in lead who plays the ostensible character will portray some daring stunts. Scripted by Sameer Abdul, the movie tells the adventurous journey of a young guy named Omanakuttan. Rohith is expected to deliver a visual delight through his maiden venture which pools into the struggles and challenges faced by a youngster. The tunes will be set by Arun Muraleedharan and Dawn Vincent. Akhil George would helm the camera for the movie which is scheduled to start rolling from January 2015. The movie to be filmed in major locations in Kerala and Tamil Nadu would reach theatres as a summer treat. Rest of the cast and other details regarding the movie would be reveled soon. A prominent production house which has deliver hits will cash money for 'Adventures of Omanakuttan'. To be creamed with humour and thrills, the movie will be highly packed with extreme fun and suspense to keep the moviegoers intact. Rohit having the knowledge working for couple of movie and short films is much known for the comedy short film 'Decent Mukku - Oru Cliched Gramam' which has received rave reviews from the spectators. Asif Ali is flying high after the critically acclaimed performance in his previous ventures like 'Appothecary', 'Sapthamasree Thaskara' and 'Vellimoonga'. As all the three movies created waves in the theatres, the actor look forward for his upcoming projects like 'Mylanchi Monchulla Veedu', 'Driver on Duty' and an untitled project directed by V K Prakash. He would be seen as a National Defense Academy in the movie scripted by Bobby-Sanjay. The movie which also tells the tale of a father-son relationship would have complicated storyline. With a long line of projects scheduled to take off by 2015, it would be the best time for the movie lovers.